2018 Availability Update: Sleigh rides are full from December 21st through December 31st. Sleigh ride times are still available now through December 20th and January 2nd throughout the rest of the winter season. As a blanket of white transforms North Idaho, visitors at Western Pleasure Guest Ranch enjoy scenic horse-drawn sleigh rides powered by one of our draft teams. 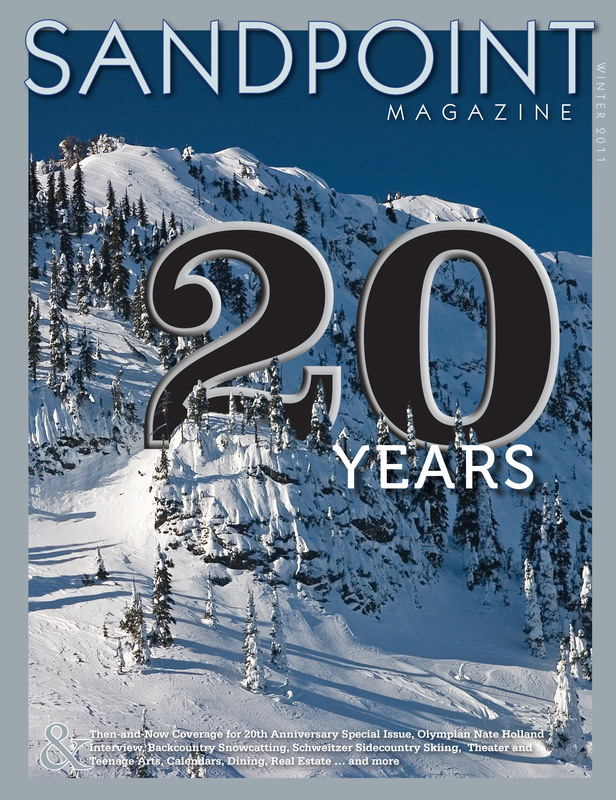 Louie and Lonestar, Jake and Julie, Queen and Justice, Lady and Fancy or BC and Albert will make you feel like a child again as they plod and jingle through a 2 mile loop trail of dense forests in the foothills of the Cabinet Mountains with fantastic views of the Selkirk Mountain Range. 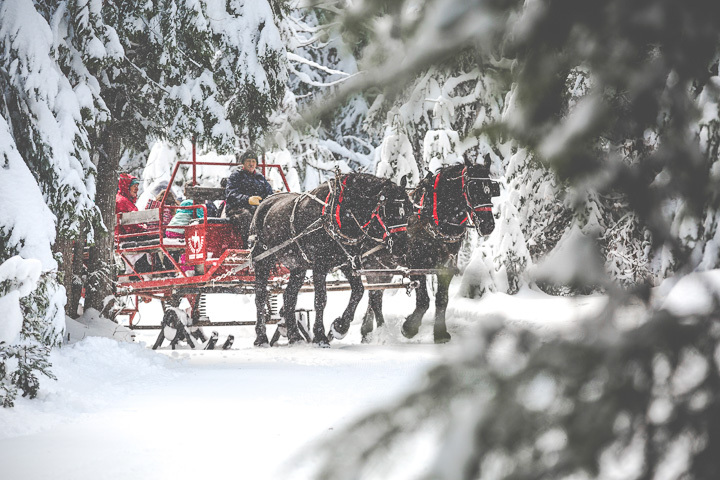 With a wide variety of horse-drawn sleighs, including a five passenger, three twelve passengers and a two passenger, we have the right size sleigh to accommodate your group. 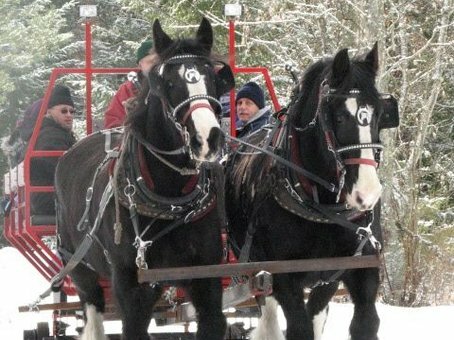 Sleigh rides are scheduled Monday – Saturday on the hour 11:00 to 6:00 pm and on Sundays 2:00 to 6:00 pm. Sorry we do not offer sleigh rides on December 24th and 25th. If you are looking for a more intimate adventure, Bud’s steady trot will whisk you back in time as you glide along in this one horse open sleigh built just for two passengers. To complete your nostalgic winter experience come into the lodge to warm up in front of a crackling fire and enjoy hot drinks and fresh popped popcorn. Also available is a sleigh ride and dinner package. What could be better for your group or family then a hearty “country gourmet” dinner served in the lodge after your sleigh ride. Winter fun at the ranch also includes cross-country skiing, snow shoeing and down hill sledding. Reservations are required. Call (208)263-9066 to make a reservation. Gather the family together, bundle up and get ready to enjoy this family outing at the Western Pleasure Guest Ranch. 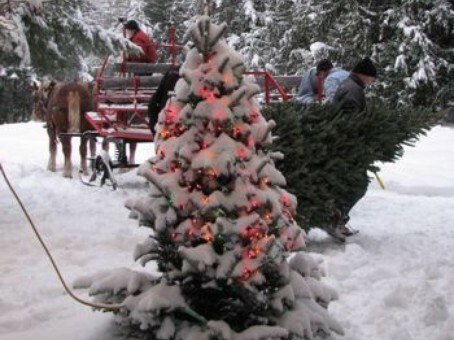 Load up on one of our horse-drawn sleighs and enjoy a scenic sleigh ride to the tree lot. There you will pick out a fresh cut locally grown Christmas tree. Then gather the family and your tree and ride the sleigh back to the lodge where you will be served fresh popped popcorn, hot chocolate, hot tea, and coffee. Available starting November 25 until the trees are gone.